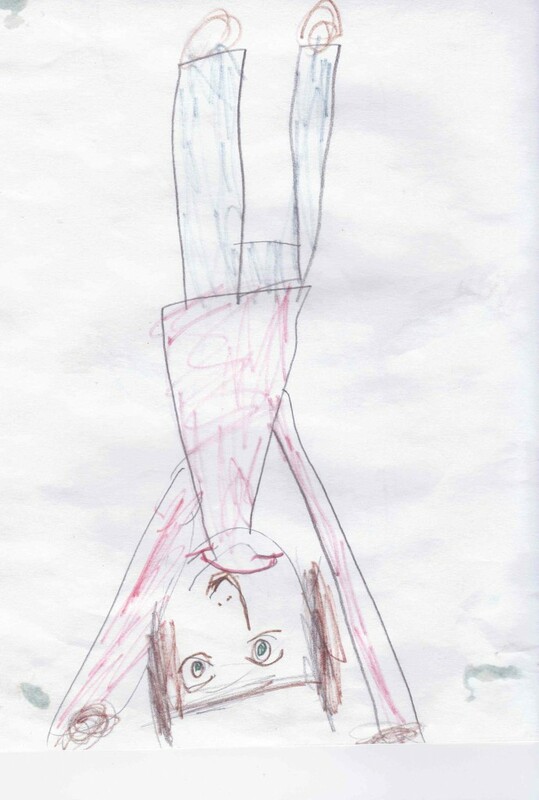 Alison Grant-Watts drew this when she was three and we used to do yoga together. Now she has her own blog. I first saw someone do full arm balance in a vacant lot in East Vancouver in 1962 when I was earning a Girl Guide badge that required me to build a fire and boil water in a billycan to make tea. Mrs. Jones, the troop leader, was there to witness the fire building and water boiling. Perhaps she was bored. At some point in the afternoon, she flung her hands down to the grass, kicked her heels up in the air, and stood triumphant in handstand. It was enchanting, magical, miles removed from what guide leaders and mothers normally did, and equally far from anything I ever imagined doing myself. 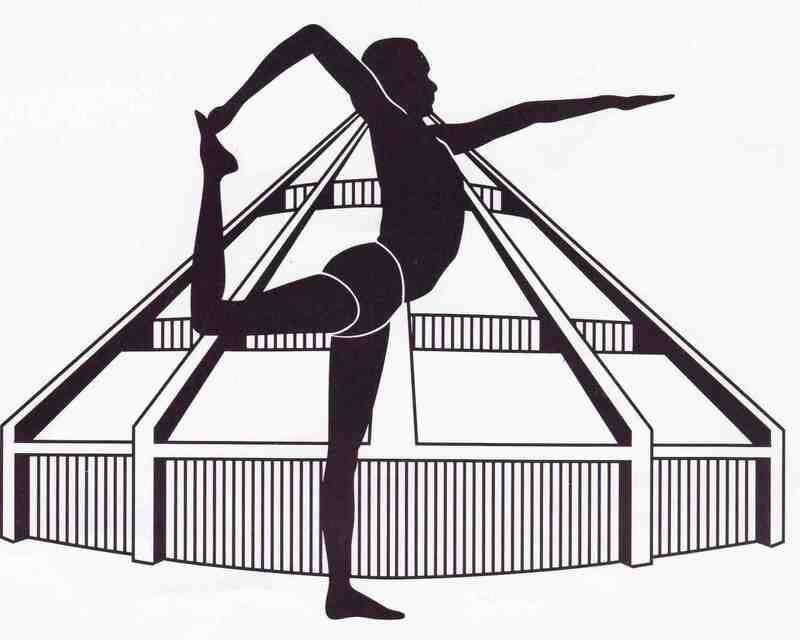 The next time I saw the pose was 25 years later in Wende Davis’s advanced Iyengar yoga class. She stood with her back to the wall, and those of us who needed help put our hands between her feet, walked in, and kicked up. I acted in blind faith – Wende thinks I can do this, so I can – and landed lightly at the wall. I felt a hit of fearless-and-free, a rush like nothing I’d ever felt before. By the time I came down, I was in love. We all fall in love with particular poses, I suspect. There are, of course, the easy ones that feel good right away and seem to love us back. But I’ll bet I’m not the only one who saves the passion and obsession for my unrequited loves, the poses that are difficult, glamorous and elusive. 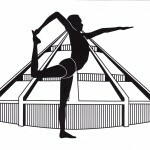 We make them into benchmarks: once I can hover effortlessly in Chatturanga Dandasana, or fold like a jack-knife into Upavistha Konasana, or yes, kick up confidently in arm balance, then I will finally be strong, or flexible, or fearless. In classic girl-meets-pose terms, my love affair with arm balance went like this: girl sees pose from a distance, girls tries pose, falls in love with pose, gets pose, loses pose, then, in what seems like an endless series of temporary breakthroughs, gets it back and loses it again repeatedly for the next 21 years. After my first brilliant moment, I tried arm balance in class a few more times, then brought it into my home practice, only to learn that I had invited my own black beast to live with me. Alone at the wall, faced with flinging myself backwards, I was gripped with fear, and could barely get one foot off the floor, much less two. I set up a sequence: a chest opening, front thigh stretch, Supta Virasana, dog pose and arm balance. Every time I practiced, I tried kicking up. Once, it worked flawlessly. Then it stopped working. I concentrated on half-arm balance, reasoning that if I built my strength with my feet on the wall, I would gain confidence for the full pose. 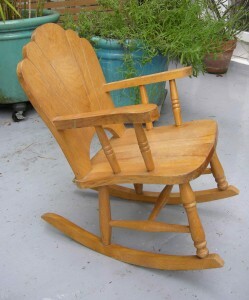 The diabolical rocking chair, still available, free to a good home. As unrequited lovers will, I made up a story about why it wasn’t working, a comforting, but ultimately useless explanation which hinged on the diabolical rocking chair I had as a toddler. Any time you went fast, you were in danger of tipping over backwards and landing on your head, with the chair on top of you. I know it happened, because I remember being told that if I didn’t stop flipping over, the chair would be taken away from me. No wonder I clenched every time I tried kicking up. I practiced kicking up every day and letting go of the results. I strengthened my arms. I walked in closer. I focused on bringing my pelvis toward the wall. I learned to exhale as I stepped in and inhale as I kicked up. I lifted my heart as I kicked up. All of it worked for a while and then stopped working. I’d be back where I started, kick-up leg touching the wall, second leg not quite there. Now, after 21 years of off-again, on-again arm balance, I seem to have mastered kicking up. Most of the time. Even, sometimes, with the second leg. The secret? I look up. Not at the mat, not at my thumbs, as I’ve often been told, but up, toward the wall. With my head lifted, my shoulders press into my back ribs and my spine feels strong. If I drop my head, I lose my upper body connection. Why it took so long doesn’t matter either. Now that the quest is over, I’m left wondering why I put so much weight on it, felt so bad when it didn’t work out and so good when it did. Why all the drama? Why the story? I’m reminded of the value of just showing up and trying, no matter how long it takes. 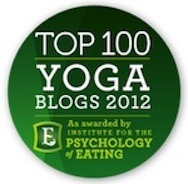 And then there’s this: most of my contemporaries outside of yoga world can’t do arm balance. True, they might not see the point of doing it, but the fact remains, they couldn’t if they wanted to. In another 20 years, I’ll be in my 80s. If I’m still kicking up into arm balance, I’ll be very pleased. You rock! I am sure you will be kicking up your heels for quite a while. I just caught up on several of your posts and as always learned something new or saw something I thought I knew in a fresh way. Loved your video of tennis ball foot rolling! And hey, great nail polish.